Despite the pre meet commentary about everything from the size of the fields to the impending weather concerns, the 40th adidas Shore Coaches Invitational went off seemingly without a hitch and the fans were treated to some great racing throughout the day. Because of the the huge difference in conditions on Saturday, it was really a “Tale of Two Invites”. The morning session was held in persistent rain that would shift from lighter to heavier every few minutes it seemed. 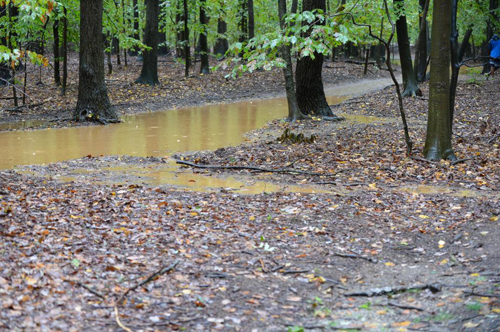 While the modern day Holmdel layout is often lauded as being fairly rain resistant, there were instances of flooded patches out on the course and officials spread dry straw over the finish area to make it less treacherous to the finishing runners. Just prior to the afternoon session, the rain stopped, the sun emerged and moderate temperatures prevailed, making the afternoon session a much different scene. Somehow Ridge got mixed into your merge as Ridgewood. Ridgewood’s kids are Halvorsen, Jeffers, Cleary, Taylor and Martin with Adams and Reis. This entry was posted on October 5, 2014 by Patrick Montferrat in 2014 Cross Country and tagged Fraulo Race Timing, Shore Coaches Invitational.